Figure 2-32. 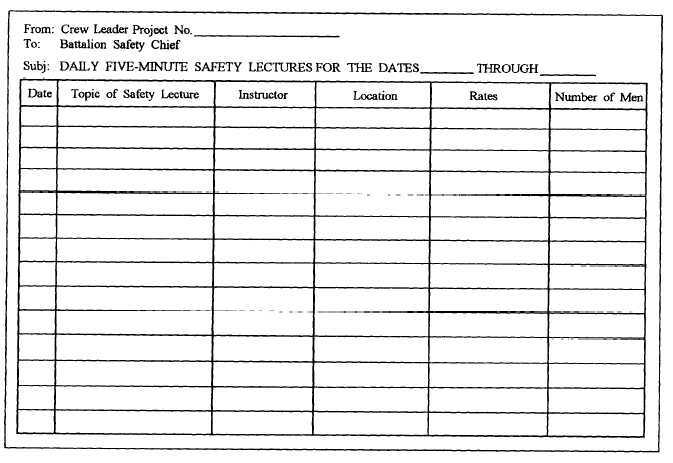 - Daily stand-up safety lecture form. All electrical portable tools, extension cords, small gasoline, pneumatic, and power-actuated tools (including those borrowed from other units) must be inspected monthly and tagged with the safety color of the month. Equipment or circuits that are de-energized shall be tendered inoperative and have tags attached at all points where such equipment or circuits can be energized. Refer to 29CFR1910. 147 and ANS1 Z244.1 for lockout/tag-out procedures. Asbestos removal is not normally conducted by NCF personnel. COM2NDNCB/COM3RDNCBINST 5100 series gives detailed guidance on NCF asbestos policy and procedures. Banks more than 5 feet high shall be shored, laid back to a stable slope, or provided with other equivalent protection where employees may be exposed to moving ground or cave-ins.